The Machinist Technology program starts students out with the basics of machining: operating manual machines the “old school” method. Students train with manual lathes, mills, and drill presses while completing a variety of projects shaping metal. Students learn about geometric tolerancing, mechanical principles, and how to read blueprints. The second half of the program gets into new technology and CNC machine operation. Students learn 3-dimensional design and learn line-by-line CNC programming. Students refine their skills on each machine by completing challenging projects, creating useful tools and parts in an on-the-job atmosphere. Graduates will be able to assume entry level positions as machinists, machine operators, metalworkers, CNC operators, CNC programmers, and CNC set-up personnel. 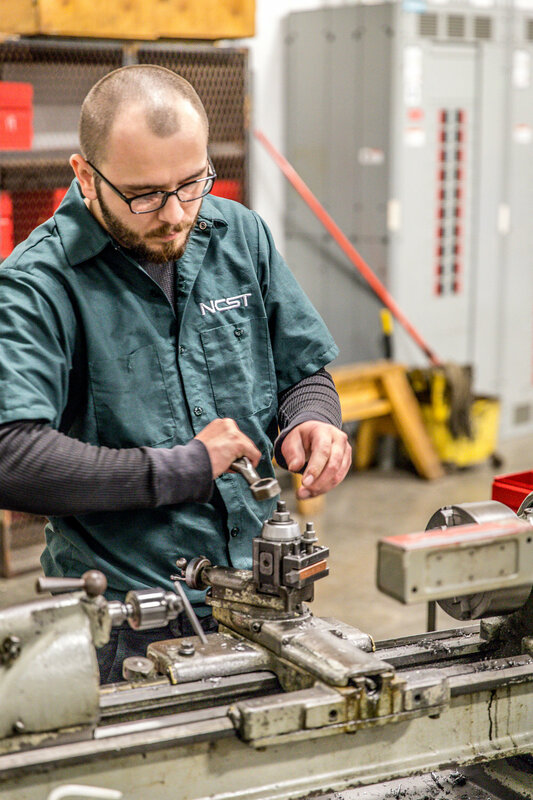 Students will utilize the following equipment: horizontal band saw, milling machines, lathes, hydraulic presses, arbor presses, drill press, xturing jigs, precision measuring instruments, CNC lathe, CNC mill, surface grinders, and pedestal grinders.